If you are new or relatively inexperienced to using a color managed digital imaging workflow, this workshop may appeal to you. Do you struggle with getting the image on your monitor match the prints that you make? If so this workshop will help you investigate the important procedures required to go from capture to print. Participants will receive hands-on and practical instruction necessary for setting-up and utilizing a color-managed workflow which is integral to managing files from capture to final output. 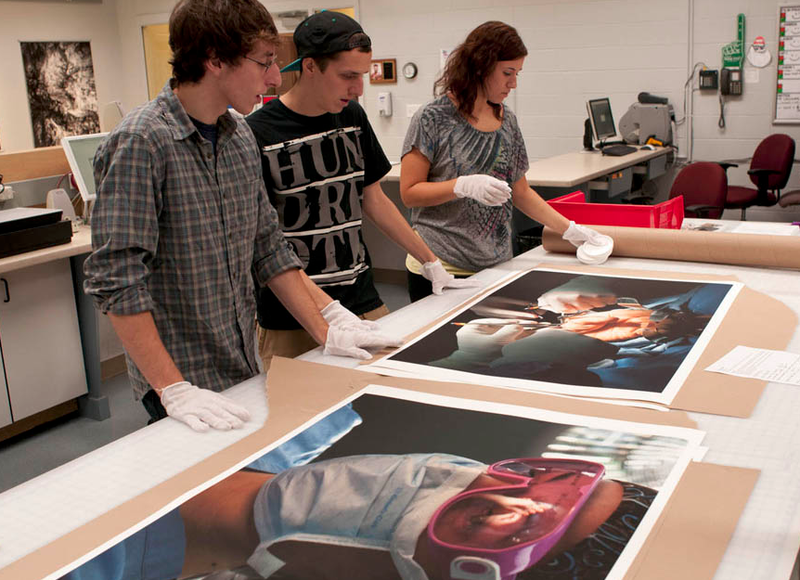 Hands-on experiences with personal files using the School of Photographic Arts and Sciences state-of-the-art equipment and facilities. Participants will walk away with a broad and extensive knowledge of contemporary practices for workflow and required steps to achieve greater control of practices leading to desired outcomes. Educators, Photographers, and others who want – or need to – learn how to manage color images from the stage of initial capture to output. Participants should bring their own digital images, slides, negatives, or other relevant document enabling a richer experience in the making of inkjet prints on a variety of printers and papers, up to 44″ wide. Fall is coming! You know what that means… Workshops! This fall we have an entire lineup of workshops in the making for you to attend. September 11, 2010 Metal Printing Workshop (1 day) This is a one-day workshop for printing on Booksmart Fine Art metals. The workshop will discuss printing & finishing techniques many of our customers have utilized. September 16th- October 14th (Thursday nights)- Digital Imaging 101 (5 days) Topics that will be included are Photoshop preferences, tools, layers, tonal & color correction techniques, image workflow, and file basics. September 25, 2010- Digital Darkroom Workshop (1 day) The workshop will teach you how to apply the techniques digitally that one used in either a B&W or color darkroom. October 20, 2010- Intro to Fine Art Inkjet Papers (1 day) FREE! This workshop will help your decide what the best inkjet paper is for your work. October 23rd- 24th 2010- Print to the Bookshelf: Bookbinding (2 days) This workshop will teach artist several methods for binding books with an emphasis on traditional binding techniques. A few hours will be designated towards discussing alternative binding structures. November 6, 2010- Metal Printing Workshop (1 day) This is a one-day workshop for printing on Booksmart Fine Art metals. The workshop will discuss printing & finishing techniques many of our customers have utilized. November 20, 2010- Nik Software Workshop (1 day) Learn about Nik Software’s latest photo enhancement plug-ins and filters for Photoshop, Aperture and Lightroom with former Nik Software Product Specialist, Sean Dyroff. November 21, 2010- Black and White Digital Printing Workshop (1 day) This workshops will teach you the different controls and options for creating B&W prints that rival the quality of silver gelatin prints. Just go to www.booksmartstudio.com/store/workshops-classes and sign up for any or all of these workshops today! Creating B&W prints with the various ink technology available. This workshop will teach you the different controls and options for creating B&W prints that rival the quality of silver gelating prints. Ink technologies that will be covered are: Epson Ultrachrome & Epson K3. Control for each of these products will be the main focus of the workshop. Participants should bring files that are ready for printing. Topics will also include various methods for controlling the aesthetic print quality. Techniques covered are similar to those one applied in the darkroom, such as but not limited to: dodging & burning, contrast control, and tonal control. Sean worked for Nik Software for several years and played a major role in the development of every current major Nik Software plug-in including Dfine 2.0, Viveza 2, Color Efex Pro 3.0, Silver Efex Pro, and Sharpener Pro 3.0. He also created many of the educational materials related to the plug-ins while traveling the country to teach photographers about the newest releases of the plug-ins and how the integrate into different photographic workflows. This workshops will teach you the different controls and options for creating B&W prints that rival the quality of silver gelating prints. Learn to optimize your B&W printing workflow with control you never had in the darkroom. Participants will leanr to control every aspect of printing digitally to produce gallery quality exhibition prints. Ink technologies that will be covered are: Epson Ultrachrome & Epson K3, Canon Lucia, & HP Vivera inks. Control for each of these products will be the main focus of the workshop. Participants should bring files that are ready for printing. Booksmart Studio & Lumiere Photo Partner to Offer Digital Workshops. Booksmart Studio in conjunction with Lumiere Photo has announced a series of digital hands-on workshops & educational presentations. Topics range from the pixel to digital printing to making the artist book. Digital technology changes so frequently that it is hard to keep pace while creating your artwork. Booksmart Lumiere Workshops has created a venue that will assist professionals and avid amateurs to update their digital knowledge facilitating the creation of art. Booksmart Studio and Lumiere Photo have teamed up to bring clarity and integrity to digital image making, offering a balance of solutions for every type of digital image-maker from the amateur to the professional. • Lumiere Photo offers a full spectrum of products from archival materials to digital supplies and services including high quality capture techniques, wide-format digital printing, short-run artist book production, & digital workflow solutions. • Booksmart Studio offers digital imaging workshops, color management support, digital workflow solutions, consulting, and fine edition book arts. This collaboration allows for a full-range of book publishing services ranging from ISBN registration to distribution. The Booksmart Lumiere workshops enable image-makers the option of creating a handbound, one-of-a-kind book to a short run production edition. By Eric Kunsman|November 19th, 2005|Categories: News, Workshops by Eric Kunsman|Comments Off on Booksmart Studio & Lumiere Photo Partner to Offer Digital Workshops.